Seems they're pretty excited over in Portland, USA. 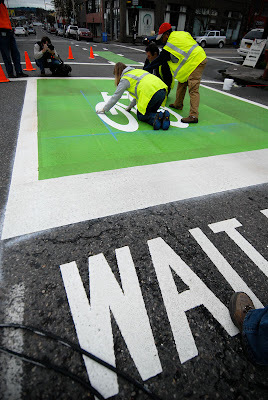 They have begun using lovely painted bike lanes and bike boxes. Three cheers for Portland. It's a wonderful sight to behold. I love the way the workers in the photo are so concentrated and really making an effort to do it just right. Here in Copenhagen a truck stops, a man hops out and slaps down a template and starts spraying, followed by blow torching to make it dry quick. It's all over in a flash. I seem to recall seeing lanes painted 'Copenhagen blue' in Portland, but this green is really a lovely colour. It's funny to see the massive text WAIT HERE, but motorists need a helping hand with this development, so it's a nice touch.